We are delighted to have had a visit from our colleagues who recently joined the ranks of the happily retired. Despite their global travels Sue and Z had not visited South America and started off their Peru trip with a few days in Barranca. 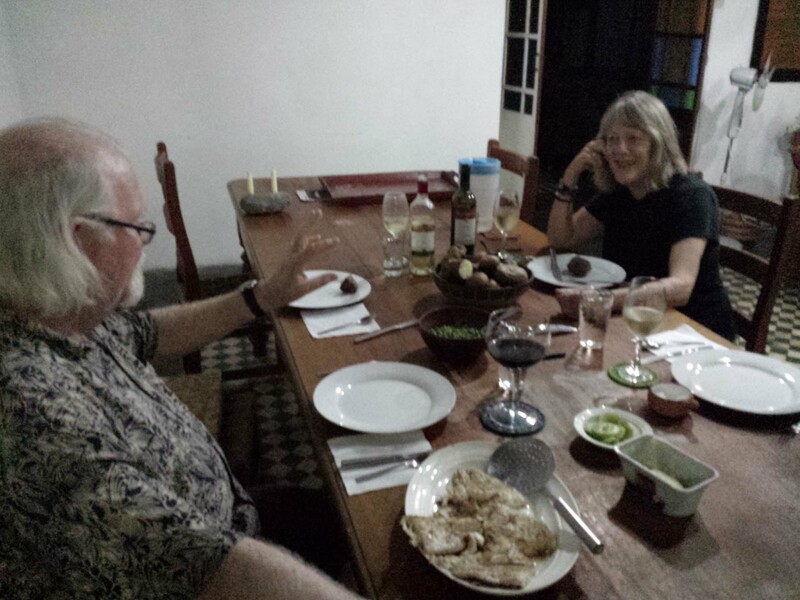 After visiting the market, our dinner was sauteed fillet of corvina filleted by Jonathan from the whole fish, peas and a festival of Peruvian potatoes. We baked Amarillo, Huayro, Peruanitas, Negros, and a couple of others. All delicious with a bit of olive oil, salt and pepper. We even drank Peruvian wine. Some of it is good now. We had to visit a site so that they could see the wonderful 5,000 year old places we’ve worked. We could have taken them to several very large, very dry, very rocky sites, but we settled on Porvenir, where we worked in 2003. There has been a lot of looting at Porvenir. The circular plaza, used as a burial ground by later people living in the area, is almost completely destroyed. Human bone, scraps of cloth and broken pottery lie abandoned where looters left them. Looted circular plaza is the light patch, left center. From Porvenir, we detoured past the home of the honey lady, who has the best honey I’ve ever tasted. She wasn’t home, alas, but we saw some of her wildlife. Where gobble and peep end up. How to keep the ducks off the furniture. With our feet sinking in the dust up to our ankles at the site, we needed showers when we got back. The next day we visited the fishermen at the end of the beach. Sue has carried out research with artisanal (small-scale) fishermen, and was interested to see them and ask a few questions. 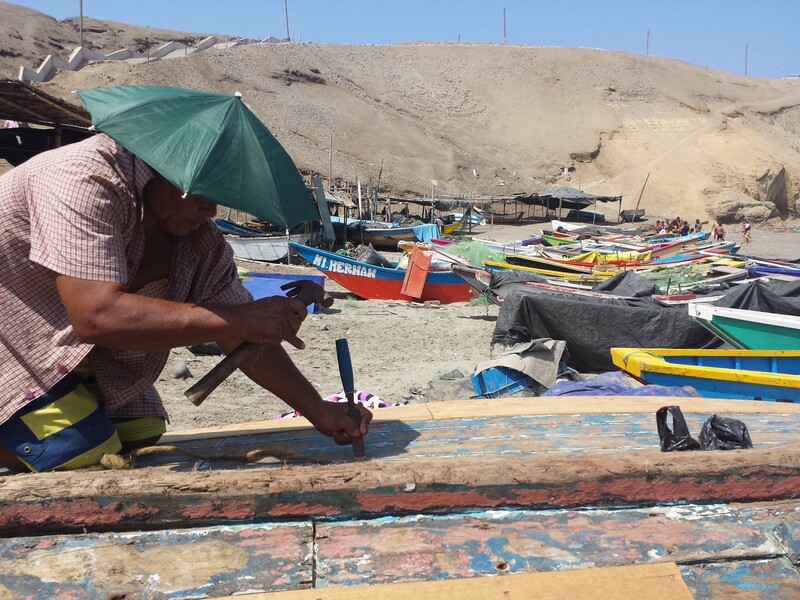 We found a man repairing a boat while he waited for the rough seas to abate–probably by the end of the weekend. What fascinated me was his repair. New planks were tornillo, resistant to rot, he says. He was filling the substantial cracks between planks with oakum. He used a hank of fiber, this material dates back to Dickens’ day when it was produced in poor houses and debtors prisons by people forced to unravel scraps of rope (picking oakum). No silicone caulk for this guy! 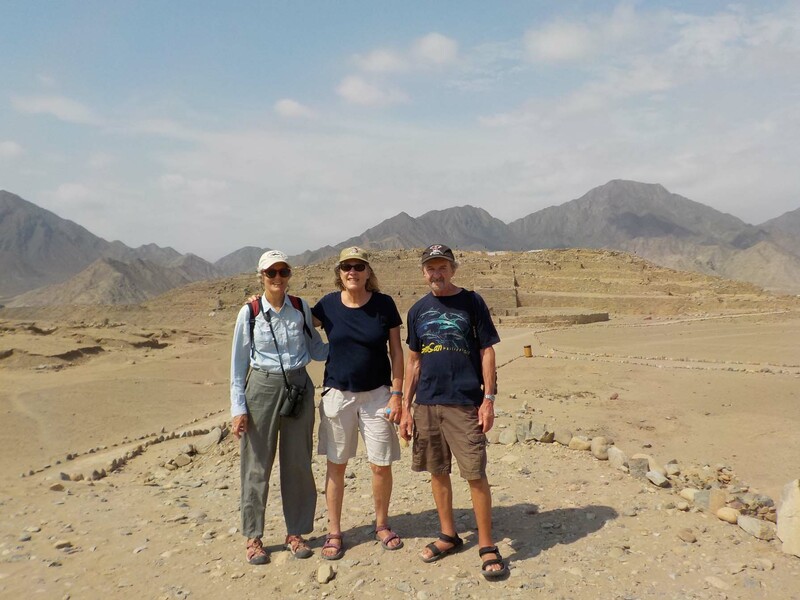 We decided to visit Caral, so that Sue and Z could see the reconstructed version of what they had seen at Porvenir. We arrived at the site in mid-afternoon. Ironically, the Supe River is quite high and we could not drive through the river to reach the site, so we had to continue down the road another mile, turn right in the hamlet of Supe, and find the parking area for Caral by the substantial footbridge that has been built across the river. We passed up a ride in a horse cart part of the way to the ticket office. The sign said 300m, and how far could it be, anyway? Big mistake. After an interminable walk through 90° heat, we reached a point from which much of the site was visible. Excavated areas are wrapped/covered with white material, and roofs have been erected over some areas. There are flags on several structures to try and wave off birds. The effect is a bit incomplete, but gives a sense of the structures. Later, our guide pointed out that the goal is not restoration, but only to rebuild what is excavated, hence the partial walls and stairways. You can compare today’s photos with the previous ones from Porvenir where all you see is rock, the unreconstructed versions. There was no longer a sign toward the ticket office, but a sign for restrooms pointing off toward a distant area. Sue and Z headed for the nearest structure while I went to the ticket office. It is positioned in a low spot (by the rest rooms) so that it doesn’t detract from the site, but I would have given a lot for a ride in a golf cart at that point. The temperature was approximately that of the center of the sun, and I hustled our mandatory guide off to the main pyramid before we collapsed from heat stroke. He tried manfully to interest us in visiting more of the site, and managed to get us to an overlook point built on a big mound of back dirt from the excavations (good use of back dirt). We look pretty good for being burned to a crisp. We took our pictures, looked at the circular plaza by the main mound, and walked around the corner of the next large mound, ready to leave. We weren’t able to take the most direct path (the archaeologists don’t like you to use the direct route) and the “authorized” path goes a circuitous route–I finally told our guide that we were not taking ONE MORE STEP the wrong way. We turned back toward the car and, mercifully, air conditioning. I will not mention the guide’s name. It’s not his fault that it was outrageously hot and his canned training was uninteresting. A former laborer on the excavations, he and several of his fellow workers have been trained as guides and now give tours. NEVER GO TO CARAL BETWEEN CHRISTMAS AND EASTER. That is what we learned. It may be the only restored site from the Late Archaic time period, but the center of the sun is not a happy place. We stopped for cold water and cool sodas in the village, the air conditioning blasted, and life gradually returned to our charred and blistered corpses. We went home and took more showers. Then it was time to sit on the front porch with cocktails and watch the sun set while a freighter headed north. That was a great end to the day.